Gosh, is it almost April? I've been a bit confused about time lately. I think it's partly because my work-based countdown has gotten messed up. One of things about working at the library is that I always know the date four weeks from now, because I stamp it in hundreds of books each day. However my branch is closing for a month to have work done, so I've been stamping May dates into books for the last three weeks. This means that it feels like April has snuck up on me this year. After last year me and my husband decided we definitely had to go again. Now that it's a week away I'm looking forward to it, whilst also feeling a little startled that it's so close (due to aforementioned time issues I'm sure). There are various fun people I'm looking forward to seeing again, and a few people I've met online that I'm looking forward to seeing in person. Last year we were a bit overawed by it all -it being our first con and everything. I don't think that will completely go away this time, but I'm hoping that the sense of community I get from chatting to people on Twitter will keep me from hiding in a corner. I'd assumed I couldn't go this year. I work Saturdays and it was tricky enough getting one off for Eastercon, so there was no chance I'd get another off the week after. However as my branch is shut and I'm being sent to branches as a spare person it meant I could get to Leicester for both days. Bless you, Broken Lights. I enjoyed Alt.Fiction the last two times. The panels were good, it felt friendly and not-intimidating. Plus it was where I first started meeting cool people and realised that you can just go up to people and have a chat even if they do work in publishing, for the BBC, or write reviews for your favourite magazine. I'll be going solo to this one as my husband isn't so keen on the more writer-based focus. Plus his working patterns haven't changed for April. As it's a smaller con and a more relaxed one I'm hoping to meet up with several friends I haven't seen in a while and hopefully make some more. Well this really crept up on me, which is unusual. A few weeks ago my husband suggested I decide what I'm doing for my birthday, which was strange because I think birthdays should be special, and he doesn't really care if anything happens on his or not. Last year the Government made my birthday a national holiday, however it seems I have fallen from grace this year (maybe it was all those NHS petitions I signed). I suppose it might just be possible that the football people were honouring me by having their final on my birthday, but as I'm uninterested in most sports and particularly do not like football, it seems unlikely. This means that I'm having to come up with birthday plans that won't be punctuated by drunken shouting when a ball does/does not go into a net. Many of my good friends have already said they'll be there, and that's really the main thing, so I'm looking forward to a good afternoon. In family news, I am now the aunty of a 3 week old baby. So in the longer term I'm looking forward to doing fun aunt things, although most of them will have to wait a few years. This non-fiction book was recommended to me well over a year ago by a colleague. Sometimes despite all the books I have access to (or more likely because of that) it takes me a while to get round to reading books. This is a book about a family and a collection of small Japanese figurines (netsuke). The author inherited a collection of nearly 300 netsuke from his great uncle and decided to trace their journey through his paternal grandmother's family. The Ephrussi family were Russian Jews who made their fortune trading in grain and became bankers. Different branches of the family settled in different parts of Europe. Parisian art collector Charles bought the netsuke at a time when Japan was in vogue. He sent them to Vienna as a wedding present for his cousin Viktor (the author's great grandfather). I don't tend to write about non-fiction here very much, but most of the non-fiction I enjoy (as opposed to that which I find useful) has a narrative to it. This is probably why I like history so much, I think I am geared towards narrative. Parts of this book were so sad. When you're reading about a Jewish family in Vienna you have an idea what's coming. You might not know specifics, but you know enough to see that as well as things are going later chapters are going to see a horrific change in fortune. I really felt as though I learned from this book. I knew only a little of Monet and Proust and the Parisian society they lived in, but reading about it here filled in my knowledge. I didn't understand all the forms anti-Semitism could take, or how ingrained it was. I didn't know much about what Austria was like in either World War, my previous learning had always been about Germany, England or the Western Front. I knew very little about what Japan was like during the American occupation. This book was not intended to teach facts. It set out to tell a story, to understand certain people in their time and place, which it does beautifully, but I learned from it all the same. This is the third in a series of inventive teenage thrillers about a young artist, set in and around San Francisco. At this point it is very hard not a spoil the events of the previous books (especially the first). I highly recommend the series to anyone interested in Young Adult fiction. It's an especially good example of the interesting ways of text, art and digital content can be merged. Cathy's Book is the first in the series, more info can be found at http://www.cathysbook.com/. Each book in the series takes of form a journal and each page is filled with sketches and doodles that support and play with the story being told. The first two books have full-colour photo plates in the middle showing the clues found by the irrepressible Cathy and her tech-savvy friend Emma. Further info about their investigations -including voicemail messages and a website apparently set up by one of the characters- are available online. I've been waiting for the third and (looks like) final installment in this series for some time. The final book doesn't have as much investigation as the first two, there isn't a jumble of photos, letters and other clues in the centre of this book. 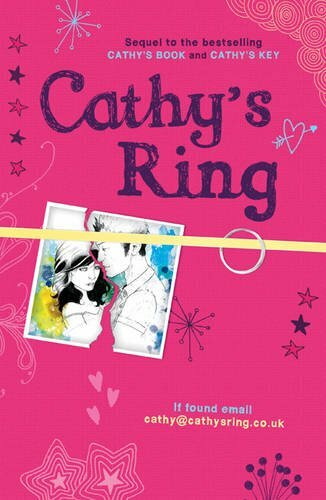 The story is more about Cathy reacting to the dangerous events of the first two books and trying to escape her problems, before realising that is not the answer. The humour of Cathy's words and illustrations is still there. There's an amusing bit where two characters, who share a mutual distrust, must disguise themselves as clowns using only what they can find in their handbags, and the pictures really make the scene come alive. Two superheroes fight in the skies above prohibition-era New York, as bootlegger Rex escapes the cops and a mob boss in the allies of Manhattan. In the Empire State private detective Rad Bradley is assaulted by men in gas masks before being hired to find a missing woman. Rad's journalist friend Kane is investigating the mysterious return of a warship, the first to come back from the lands of the Enemy since Wartime began. Their enquiries lead Rad to the eccentric Captain Carson and his impossible photographs, and it's clear the the PI is mixed up in something very strange. The setting felt realistic, even the bits set in another world. The tone worked well, there was a bleak, oppressive greyness that suited the events of the book. There were parts that felt a little disconnected, but that fit with the tone and the setting, as the reader is aware from early on that something isn't right. 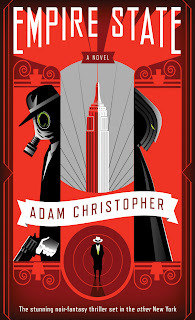 Empire State is a good book, but I didn't enjoy it as much as I thought I would. Expectation is a funny thing. It can be easy to get excited by something, even if you don't know much about it (that's how advertising works after all). I think I was expecting something a bit different and that created a disconnect in my mind. There were a couple of sections early on -mostly involving female characters- which I thought were really great, but they weren't the focus of the plot. About half way through I found myself drawing favourable comparisons with Dark City, there's a similar sense of darkness and unease in both. The end made me feel a little confused, though it has since occurred to me that I am not particularly well-versed in the noir genre. This book is more an SF noir than it is anything else, and that might be part of what threw me off.